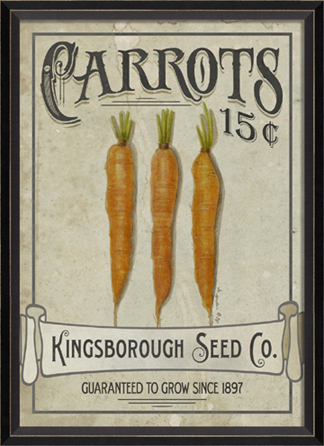 Literally, the French expression “les carottes sont cuites” means that the carrots are cooked. Figuratively, it means that the jig is up, that whatever one is discussing is all over and can’t be changed, that one is saying “ENOUGH ALREADY!” We can hope in this case that it means that our long winter has been cooked. 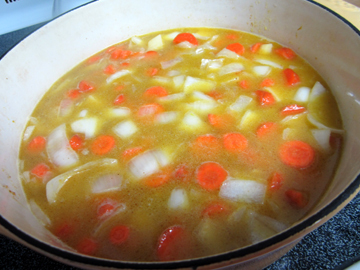 The cooked carrots in the soup below are ideal for the sort of spring we have had so far in the northeast. In this chilly weather soup calls to us. The curry powder and cumin lend an Indian tang to the mundane root vegetables, and the finished product pleases the eye and the palate. If you don’t have a blender or immersion blender on hand (my sister-in-law Leigh and I couldn’t find one the first time we served this, although it turned up for subsequent meals! ), a potato masher will render the potatoes and carrots small enough to make them sippable. This colorful soup would make a lovely first course for an Easter dinner or a Seder (if you keep Kosher and want to use it in your Seder you might want to substitute olive oil for the butter). By the way, Margie from Shreveport, Louisiana, won The Cast-Iron Skillet Cookbook. She seemed very pleased when I wrote to her. Thanks to all those who entered the drawing for this book! I’ll try to have another one soon. Meanwhile, happy Easter, happy Passover, and happy spring! Warmer weather WILL come…. In a large saucepan or Dutch oven melt the butter. Sauté the onions and garlic; then stir in the potatoes and carrots. Cook for a few minutes, stirring frequently, and then add the stock and the salt. Bring the mixture to a boil. Cover the soup, and reduce the heat. Simmer until the vegetables are tender (about 1/2 hour). 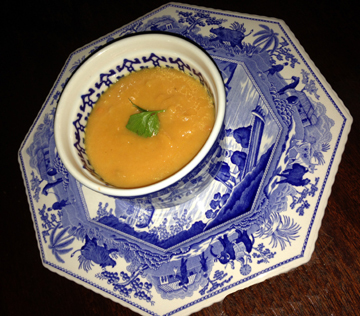 Puree the soup, either in batches in a blender or in its pot using an immersion blender. Stir in the spices, and heat the soup again briefly. Taste and adjust seasonings. Just before serving add the lemon juice. If you don’t use all your soup at the first serving, you may certainly refrigerate the leftovers for another meal. When you reheat the soup it tends to become very thick and erupt. Feel free to add a bit more stock to settle it down. You may also want to add more spices as their flavor tends to dissipate over time. This entry was posted on Wednesday, April 1st, 2015 at 4:00 am	and is filed under Uncategorized. You can follow any responses to this entry through the RSS 2.0 feed. You can leave a response, or trackback from your own site. Yum indeed! Happy Easter, Krysia. I’m going to try it tomorrow. Thanks. Somehow, I ended up with a huge amount of organic carrots in the vegetable bin. I don’t know what I was planning when I bought them, but this weekend I went through the fridge to try and use things up. I made spinach lasagna using left over ricotta and bits of cheese, and a quiche to finish up some cooked bacon, broccoli and a plethora of eggs. I made chicken soup with some of the carrots, but still have tons left and I want to use them up rather than throw them into the compost heap. This soup will be perfect. I’ll probably use my food mill so it’s pureed but still has some texture. Sounds delish! I hope you love it, Grad!